For Flashback Friday , I'm bringing back a wonderful fall supper dish. 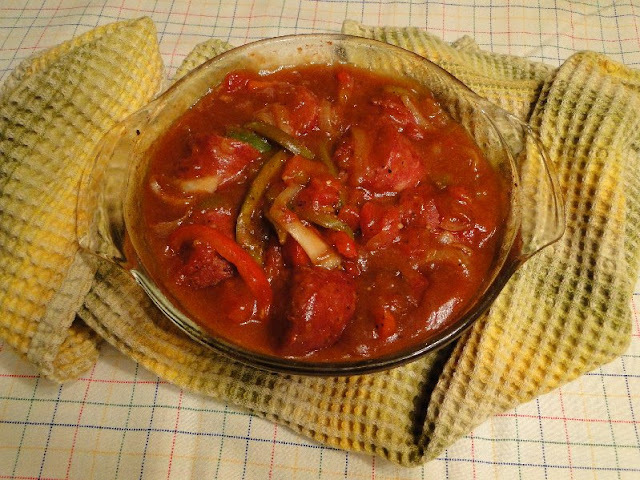 The farmer Sausage used in this recipe is a smoked pork sausage made by Mennonites. It is made in many communities throughout Canada and the US where Mennonites live. It is also available at our local Safeway and at several other grocery stores. Farmer sausage varies in texture and spices from area to area. The sausage I buy is made in Abbotsford by Rempel Meats. I'm sure you could substitute a kiebasa or ham sausage for the farmer sausage. Saute' onion slices until they begin to soften. Add peppers and onions to sausage in dish. Mix remaining ingredients and pour over sausage. Bake at 350º oven for 45 minutes to 1 hour. Farmer sausage (smoked sausage) is my rescue meat for me. If I have forgotten to take something from the freezer this versatile sausage can make many things, from soups to casseroles it is always a hit. I like you version too and have made something similar. I must try the liquid smoke, I haven't bought any in a long time, that would be good. lOVELY MEAL FOR THE COLD DAY WE ARE HAVING. Farmer sausage is wonderful in so many recipes. This one looks good Bev, I love the addition of peppers! In the past we have gone to Abbotsford just to bring back some of that good Mennonite meat. A couple of years ago we planned a trip and were told at the US/Canadian boarder that we would not be able to bring any meat back into the US. Are you aware of anyone in the Seattle area that makes some really good sausage, cracklings and liverworst-(not the grocery store kind). You are not allowed goat or lamb. We take all our own meat across when we camp in Birch Bay. We enjoy Funk's sausage, and we can get it here in langley easily at the Big Box Outlet in Walnut Grove. Irene K.
I wish I could say yes, Bev H.but I don't know of any place off hand. My son lives in Seattle and loves farmer sausage. He has taken it across on several occasions with out any trouble. I guess you could try and the worst that could happen is that you'd have it taken away. I know there was a problem with beef in particular several years ag, but we've never been asked about pork products. Is there a farmer sausage soup recipe char that you could post? Made this the other day with lots of chilli flakes, was watery when it came out of the oven and I had to go to work, left it on the warming element when I left the house, it was dark and dry 10 hrs later but still tasty. What a wonderfully warm and cozy meal. Just stopping by to say I hope that you are enjoying a wonderful long holiday weekend. May you have good food, friends and family. That looks delicious Bev! Nothing quite like Mennonite made farmer's sausage. I can still remember how my parents and uncles and aunts had sausage making "bees" with our own home grown pork. What fun that was and oh, the deliciousness!! !